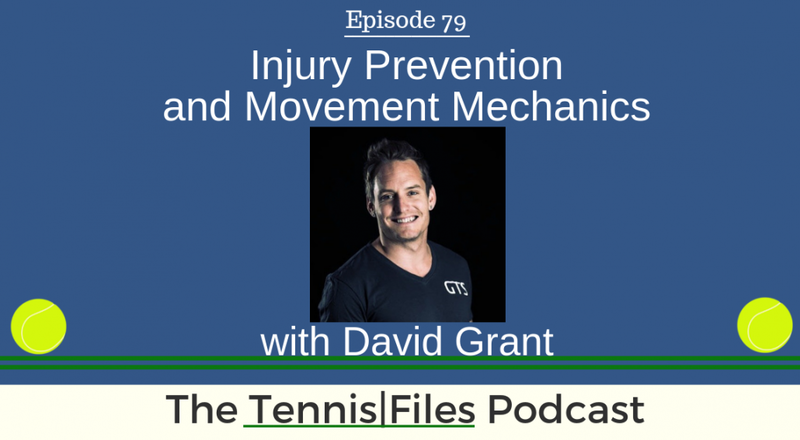 On Episode 79 of The Tennis Files Podcast, I spoke with licensed athletic trainer and performance coach David Grant about how you can prevent injuries and improve your movement mechanics. David is the founder of Grant Training Systems Lifestyle & Sports Rehabilitation, a sports performance based company focusing on the education and training in the field of movement and mobility. One of my podcast listeners, Charlie, connected me with David, and I'm really glad he did! I had a blast speaking with David about how what steps we can do to recognize and minimize injuries, which is so crucial if you want to stay in the game for a while. David has worked alongside Pat Etcheverry at the Harry Hopman Tennis Academy in Tampa and has trained some of the best players in the world, including Victoria Azarenka, Justine Henin, Martina Hingis, James Blake, and Mardy Fish. David is also an adjunct instructor in Germany at the University of Tubingen, where he teaches students about the training, rehabilitation, nutrition, and political nature of working with pro athletes and professional teams. David previously was the Director of Athletic Performance for the Egyptian Tennis Federation and the Director of Athletic Performance for the Smash Tennis Academy. On this episode, we talk about David's philosophies on injury prevention, his super interesting career in the tennis fitness world and at top academies, how to recognize if you are at risk for injury, the best exercises for increasing your flexibility and mobility, recovery advice, and much more! I really hope you enjoy my interview with David! Let us know what you think about this episode in the comments below! GTS Training Programs - Exclusive Offer for Tennis Files Podcast listeners: Type in "tennisfiles" in the coupon code section to receive 45% off training programs until March 1! For more tips on how to improve your tennis fitness, subscribe to my newsletter and download a free copy of my Tennis Fitness Workout Guide below! Thanks for listening! Get Your Free Tennis Fitness Workout Guide! Sample workouts to improve your strength, power, endurance, and performance on the court. Enter your first name and email to download your free tennis fitness workout guide now!